When: Jan. 16, from 7 p.m. to 9 p.m. Doors open at 6 p.m.
Tickets: The cost is $5. Get tickets at Spokane7tickets.com. What’s next: Northwest Passages welcomes Pam Houston (“Deep Creek”) on Feb. 12 and authors Sharma Shields and Nancy Pearl on March 13. A few days after 17 students died in a shooting at Marjory Stoneman Douglas High School in Parkland, Florida, the school’s librarian received an email message from Chris Crutcher. Crutcher, a Spokane author of books for young adults and a retired therapist, was offering to come to Florida and give a presentation. A couple months later, Crutcher and several other authors participated in a two-day literary festival for the students at Stoneman Douglas, at a time when the school and community were still suffering. It was a tragically unusual event. But it was also right in Crutcher’s wheelhouse: the place that combined his service as a therapist for traumatized kids and his long career as a popular author of novels about the highs and lows of adolescence. He and the other authors gave readings and answered questions. They found that the students were eager to talk, to unload their secrets, to connect with someone who would hear them. Crutcher has built an extraordinary career as a witness. He worked as a therapist and counselor for traumatized kids in Eastern Washington for more than 30 years. His career as an author of 15 books – his newest, “Losers Bracket,” is just out – has run on a parallel track, drawing upon his experiences with those kids to create truthful fictions that, in turn, connect with students who might see reflections of their own problems in his books. It is perhaps natural, then, that he would engage with the students who survived the Parkland shooting, just as he did the students at Freeman High School after a student there shot and killed another student and injured three others. He understands what happens when mortality crashes unbidden into the lives of children. Crutcher, 72, grew up in Cascade, a town of some 900 people in central Idaho. His father owned a gas station, and was involved in local politics, and his mom was a homemaker. He played eight-man football – the run-and-gun game of towns too small to field 11 players – and some of his best friends were the children of Japanese-Americans who had been interned at the Minidoka War Relocation Center in Southern Idaho. Early on, he recognized that being the son of a prominent businessman and school board member gave him advantages. “I realized pretty early that you got more chances in the office if you were me than if you were them,” he said. While he was student teaching in Monroe, he lived with another Eastern student – Terry Davis. Both of the young men wanted to be writers, and before too long, both found themselves in the San Francisco Bay Area – Davis was a Wallace Stegner Fellow at Stanford, and Crutcher was running an alternative school in Oakland. In those days, Davis would show Crutcher the pages of the novel he was working on, a story about a high school wrestler in Spokane. Crutcher would give him feedback, and then see the revised pages that Davis produced. Those pages became “Vision Quest,” the lauded 1979 novel that became a popular 1985 film shot in Spokane. “When it was finished, I thought, ‘He didn’t do anything I couldn’t do, if I was willing to do the rewriting,’ ” Crutcher said. After working in Oakland for a decade, Crutcher decided to return to Spokane in 1981. In a period of several months between the end of his work at the school there and moving here, he started writing a pair of novels. And in his work with the students at the alternative school, he saw his natural subject matter. And in writing that truth – reframed by fiction – Crutcher hoped he could reach young people who could recognize themselves and begin to think about what’s happening in their own lives in ways that might be easier than confronting their own traumas and problems more directly. He shared the first draft of “Running Loose” with Davis. Davis put Crutcher in touch with his agent, who snapped the book up; Crutcher has the same agent today. “Running Loose,” a story about racism and high school football, was published to positive reviews in 1983, but it wasn’t only that reception that established Crutcher’s reputation. “Running Loose” had stirred up controversy at some schools because of its mature themes, language and unflinching approach; the year after it was published, USA Today put Crutcher on a list of the most-banned authors. “Mark Twain was on it. Harper Lee was on it … and some guy named Chris Crutcher was on it,” he said. Since then, his books – with their frankness about trauma, violence, sexuality and language – have since frequently stirred up the would-be censors and morality police on a regular basis. There are worse things that can happen to an author. His work has gathered up seemingly every award available, regularly being selected for lists of the best young adult novels of all time. He has won numerous awards for intellectual freedom over some of the censorship battles he has engaged, and was given the Margaret A. Edwards Lifetime Achievement Award from the American Library Association in 2000. “Crutch is just a beloved person around the country, with teachers and librarians and with his readers,” said Davis, who now lives in North Mankato, Minnesota. It makes sense that a person with Crutcher’s set of skills might be drawn into the aftermath of school shootings. 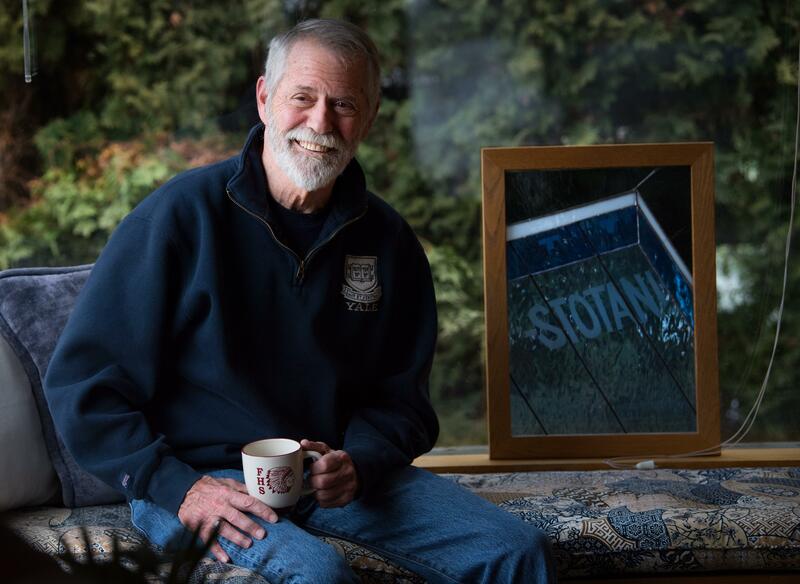 A couple of decades ago, he wrote a novel that was based, loosely, on the 1996 shooting of a teacher and two students by a 14-year-old in Moses Lake. In fact, he completed a draft of that book, and it was in the hands of his editor in April 1999, when he first heard the horrible news out of Colorado. “I turned on the TV and the kids were coming out of Columbine with their hands over their heads,” he said. Neither he nor his editor had any desire to seem to capitalize on such a tragedy. That draft went away, and Crutcher rewrote it with a different story that nevertheless took up the issues of adolescent violence and its consequences. It was published as “Whale Talk” in 2001. He had visited students at Freeman High before, and had relationships there. So after a student walked into the school with a gun stuffed in duffel bag on Sept. 13, 2017, Crutcher was there to help – to be a witness. That event – in the context of so many other shootings involving assault-style semi-automatic rifles – left Crutcher infuriated by the response of local political leaders, who wanted only to put the blame on mental health and who either ignore or underestimate the role of assault-style weapons as the constant in these shootings. Crutcher, who knows quite a bit about mental health, saw that as a failure to address the reality of what had happened in the hallways at Freeman, and the story it told about the guns in question. Caleb Sharpe is accused of taking an AR-15 and a pistol to school that morning; after trying and failing to get the AR-15 to work, he turned to the pistol. “This kid walks into Freeman High School and he had an AR-15 … and (another) kid walks up to him and all he said was, ‘You’re going to get in trouble if you do that,’ ” Crutcher said. Crutcher held up a finger. Crutcher calls Columbine the 9-11 of school shootings – the event that introduced a new kind of horror that we now are almost accustomed to. The shootings link and loop over each other; the new ones come before the last ones are grieved; a “small” shooting like Freeman barely attracts any national attention. Haneski, the Stoneman Douglas media specialist, talked about what she did on the day of the shooting. She and her staff gathered 55 students, and they all hid behind and under equipment; she kept all her keys handy for whatever needed to be locked or unlocked; they barricaded doors and sightlines through windows. Like everyone in schools these days, she’d had some training in school shooter situations. But she had also received advice from a first-hand source. “My good friend is a media specialist at Sandy Hook,” she said. Like school librarians all over the nation, Haneski was familiar with Crutcher’s work. He’s a giant of young-adult literature, for one thing. But she had also hosted him at a middle-school reading several years before. She regarded his offer to come to address the students as a valuable gift. It is unsurprising that Crutcher might take up the aftermath of a shooting as a subject for a novel. An upcoming novel, “Some Guy,” will draw on some of what he’s learned interacting with kids in the wake of school shootings with a story of a mall shooting in the Seattle area, and its effects on the young children who survived it. He recalls that during his two-day visit to Parkland, he and many others were wearing bracelets that read: Never Again. Then, during a panel on the second day, he noticed that his phone was vibrating repeatedly with notifications. A lot of other phones were buzzing too. There was news out of Santa Fe, Texas: Eight students and two teachers dead in a school shooting. “I thought, This just keeps going and keeps going and keeps going,” he said.